In-mid October I was delighted to be able to join the DIMECCE team in Lodz, Poland, for their second project workshop followed by two days of project meetings. I work as an intern on the project with the Danish team at Roskilde University, and I received the invitation at the beginning of my internship in August – naturally, I immediately accepted. It was a milestone for me during my first months as an intern, not just because it was an honour to be invited and have the possibility to meet the other scholars working on the UK and Swedish case studies and to attend the project workshop and meetings there, but also because I was invited to take part in both writing and presenting the Danish team paper. This was quite an exciting challenge for me and occupied my mind quite a lot during my first two months of the internship. DIMECCE’s second project workshop took place in Lodz (Łódź), the third largest city in Poland and formerly a very important place for textile industry. Today it still attracts businesses because of its location in the centre of Poland and being only two hours’ drive away from the capital, Warsaw. It is also a thriving centre of academic life, hosting the University of Lodz (Uniwersytet Łódzki) where the workshop took place. Alfred Biedermann’s Palace was the beautiful and ornate location of the workshop. 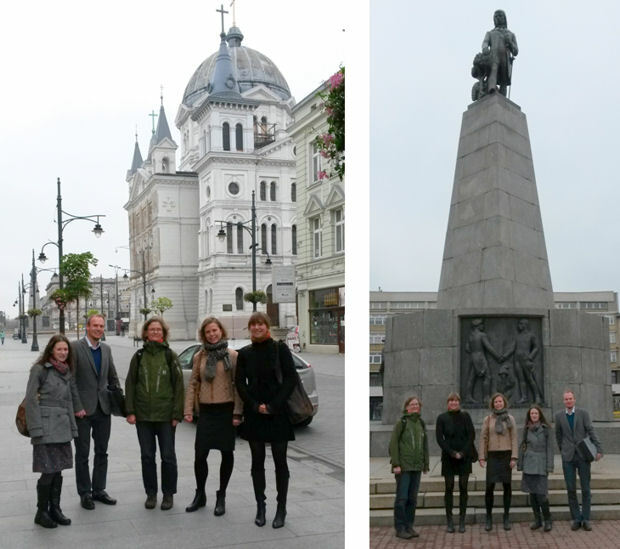 To get there, the workshop participants met in the morning at our hotel and walked together through the city centre in the company of the DIMECCE Research Assistant based in Lodz, Dorota Scislewska. It was the first time my Danish colleagues and I had seen Lodz in daylight due to our late arrival the night before. There is no doubt that Piotrkowska Street (Lodz’s main street) is the most beautiful and well-maintained part of the city, but the less glamourous streets and neighbourhoods of Lodz also have their charms and historical presence. After registration and a cup of coffee, where we had the opportunity to get to know some of the participants, we were all warmly welcomed by Prof. Tomasz Domański, Dean of the Faculty of International Relations and Political Science of the University of Lodz. The workshop organiser Dr Marta Wozniak then presented the aim of the workshop followed by DIMECCE Project Leader Dr Fiona McCallum who briefly introduced the project. There were three sessions in the workshop and luckily for me the Danish team were presenting in the first session. I was a little nervous about the presentation, even though we were well prepared, but was quite relieved by the thought that our contribution would be over before lunch! The opening paper was given by the UK team, Fiona and her colleague Dr Alistair Hunter. They made a very interesting presentation about Middle Eastern Christians’ quest for equal citizenship in the UK, which was similar to our theme about practices of citizenship among Middle Eastern Christians in Denmark. For me to gain insight into the narratives about UK citizenship was a great opportunity – it became clear to me, that this transnational comparative study of minorities (and in this case Middle Eastern Christians) was more fruitful, than firstly observed. In particular the similarities of how the communities in the UK and Denmark articulate their understandings of the terms ‘Britishness’ and ‘Danishness’ was interesting. But equally significant was the discrepancies in these narratives and the questions that they raise. For example, why did some of the British interviewees born in the Middle East articulate relatively low expectations of their level of citizenship in comparison with citizens born in the UK yet the Danish interviewees rarely, if ever, referred to such views? What are the reasons for this difference? By comparing analytical results from the different fieldworks, we receive a fruitful insight into our own research field and new interesting and previously unknown questions are raised. Another presentation that I found inspirational, was the paper presented by Dr Heidi Armbruster, a Senior Lecturer in Modern languages, University of Southampton, UK. The method and theoretical frameworks used in her research were interesting and relevant for the DIMECCE project. She based her research on interviews with Syriac Christians of the same family but from different generations which allowed her to observe how narratives of persecution in their ‘homeland’, Turkey, became incorporated into the life stories of family members of later generations in Vienna. This focus on the micro level of data, as well as her problematisation of the ‘generation’ term often used in migration discourse research, was new to me and very inspiring for further research. 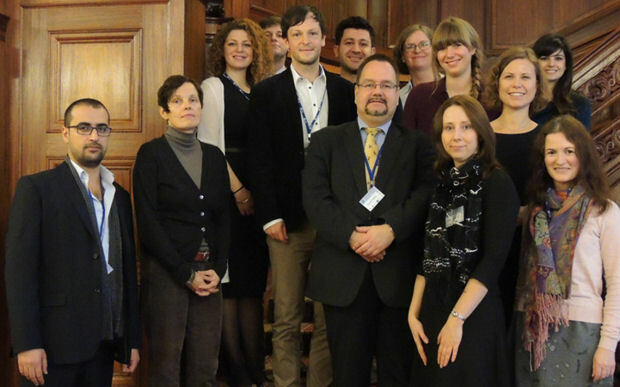 Generally all the papers presented provided some insight into the workshop theme of migration and citizenship experiences of Middle Eastern Christians in Europe. It appeared to me as if a new network of scholars working on Middle Eastern Christian migrants was initiated with this workshop and I felt fortunate to contribute to it. The following two days consisted of DIMECCE project meetings. Already during the first day I felt like full and accepted member of the team. The rest of the DIMECCE team were welcoming towards me and made me feel at ease. With these meetings I was seriously incorporated into the DIMECCE project. In two long but productive days, we covered everything from Nvivo data coding to Booklet launch events to the project monograph and much else – the insights to even the minor items on the agenda in this multi-sited research project has given me a sense of ownership which has resulted in an even stronger commitment to the project after returning to my office. Therefore I will certainly see the trip to Lodz as a milestone in my internship. Last but not least, I would like to mention my gratitude to Marta for making this week possible and for ensuring that all of us had a comfortable and rewarding week in Lodz.